Why need to backup Android: Mobile phones, with abilities like computers, offer users with easy access to send and receive real-time information. How much important data do you save on your Android phone or tablet? Probably even you yourself don't know the answer. But if you unfortunately get your Android device lost, stolen, corrupted, formatted or need to factory reset the device, you must be heartbroken because all your precious photos, text messages, contacts, videos and other more data were gone forever. Therefore, keeping a backup of your Android on computer is essential to prevent that disastrous scenario. Why need to restore Android: In the process of changing electronic products, people also replace their phones frequently. Generally, people change the phone one a year, from iPhone to Samsung, Samsung to HTC, etc. Although switching a mobile phone is very simple, as long as the budget is reasonable, moving all the data from a phone to another is not an easy task. Have you ever thought to transfer all data from your old phone to your computer, and then restore the backup files to your new Android phone with 1 click? That is obviously the simplest way to transfer data from one phone to another. Are you still managing your Android phone on the device itself one by one manually? You are out! It's time to have an assistant to help backup and restore content, such as contacts, SMS, photos, videos, music, apps, etc. from your Android mobile phone or Android tablet on computer. Coolmuster Android Assistant (for all Windows versions) or Coolmuster Android Assistant for Mac is one of the most efficient file transferring and managing software that you can not only use it to export your Android files to computer, but also sync the backup files from computer to your Android device. To know the detailed feature of Android Transfer, you can read the paragraph below. * Install and uninstall apps on computer instead of doing it on your phone. Install and launch the Android Assistant on your computer. Connect your Android phone or Android tablet to the computer via a USB cable. Then, it will ask you to enable the USB debugging on your phone or tablet (click here to learn how to enable USB debugging on Android). When the USB debugging is enabled, click "Allow" on your phone to allow the program super user authorization when an Superuser Request pops up. You will be taken to the new window of the program, with all your Android data scanned and displayed on the left side menu, including SMS, Music, Videos, Photos, Contacts, Apps, Books, etc. Choose the target files and click the button of "Export" to transfer them all to your computer for backup. One you have backed up your Android device to the computer, you can restore them in the future. What you need to do is just clicking the "Import" button to get them back to your Android device. 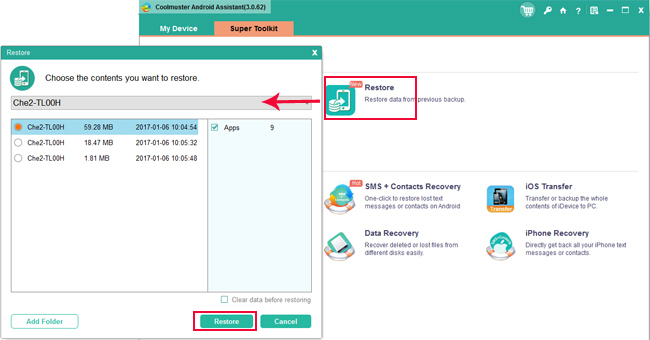 You can also use the 1-click Backup & Restore feature from Coolmuster Android Assistant to backup your Android data to computer, and restore the backup file back to your Android phone with just 1 click on the mouse. Using the 1-click operation is quite more convenient than the method 1, but you can not preview and select specific items by using the 1-click feature. How to Backup and Restore HTC Phone? How to Backup and Restore Samsung Galaxy? Preparation: Launch the Coolmuster Android Assistant and connect your Android phone to the computer with USB cable. Click "Super Toolkit" from the top menu of Android Assistant and you can see the 1-click backup and restore feature show in the new pop-up window. Backup: Hit on the "Backup" option to bring out the 1-click backup window. Select the file types you want to backup, click "Browse" to specify the output location and click on the "Backup" button on the bottom right to begin the backup process. Restore: Hit on the "Restore" option to bring out the 1-click restore window. All the backup files will be displayed here. Just choose the file types you want to restore to your phone and click on the "Restore" button on the bottom right. You can also tick off the "clear data before restoring" option if you want to delete all the original files on your Android phone. Easy Backup & Restore is a free app from Google Play Store, which can help Android users to backup Android phone data, including contacts, text messages, MMS, call logs, calendar events and other more in a ZIP archive format, so that you can read it on computer or device easily and even restore it anytime you want. It is worth a try even though some users complain the compatibility issues of it. 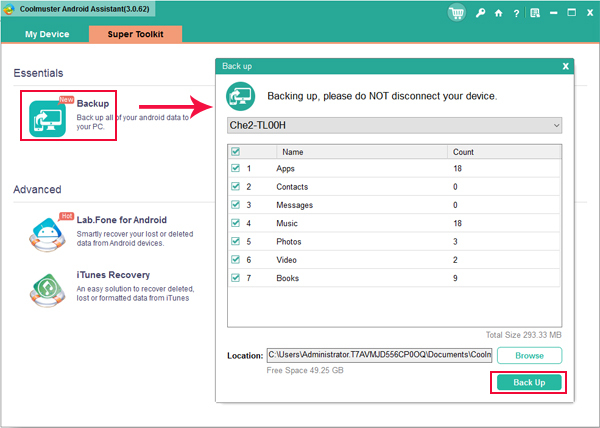 Step 1: Download Easy Backup & Restore app on your Android device. Launch it and you will be popped up with a message to ask whether you want to create a backup. Just tap "YES". Step 2: Select the file types you want to back up and then choose a location to save the backup file. Step 3: Give a name to the backup file and tap "OK". Then, the backup process will begin. Step 4: To restore the backup file back to your Android device, you just need to tap the button of "Restore". 1. Turn on your Android device and go to "Settings" > "System" > "About Phone". 2. Tap multiple times on the device's Build number until the Developer options are enabled. 3. Hit the back button and select Developer options within the System menu. 4. Toggle on the "Developer options" and "USB debugging". 5. Connect this Android device to your computer with USB cable. 6. Use either Command Prompt or Terminal to find the folder in which the ADB tools are located and type in "ADB devices". Then, your Android phone will pop up you with a window, which needs you to permit to interact with the phone. 7. Type in "adb backup -apk -shared -all -f /backup.ab". 8. There will be a full backup window on your Android device. Just tap on "Back up my data" and the back up process will start. By the way, you can set a password to encrypt the backup file. 9. Plug your Android device into your computer. 10. Use either Command Prompt or Terminal to find the folder in which the ADB tools are located and type in "ADB devices". Then, your Android phone will pop up you with a window, which needs you to permit to interact with the phone. 11. Type in "adb restore /backup.ab"
12. There will be a full restore window on your Android device. Just choose the option "Restore my data" and the backup file will be restored to your Android device immediately. Operability: It is beyond doubt that 1-click Backup&Restore feature provided by Android Assistant is the simplest way. With only one click on your mouse, you can proceed with the Android backup and restore task. Functionality: Easy Backup & Restore and Android Assistant supports more file types, such as contacts, SMS, call history, photos, videos, music, etc. and be compatible with more Android phone models. Stability: Android Assistant can be installed on all version of Windows OS and Mac OS. It is 100% risk-free and stand-alone. Price: Android Assistant comes with free trial version and its full version costs $25.95. Easy Backup & Restore app is free. Conclusion: To sum up, Android Assistant would be you best choice. It covers most Android phone models and data types. Its 1-click backup and restore feature makes the Android backup & restore process as easy as pie. But of course, choosing which program to back up and restore your Android data is completely up to you.